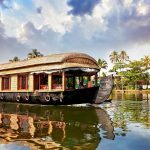 The Kerala Travel Blog – Experience Kerala | A Houseboat Cruise in Kerala - What can you expect? The serene backwaters of Alleppey and Kumarakom are the pride of Kerala. They are both tranquil and mysterious. And since the backwaters are shallow with little or no current, they offer many exciting opportunities for leisure activities. 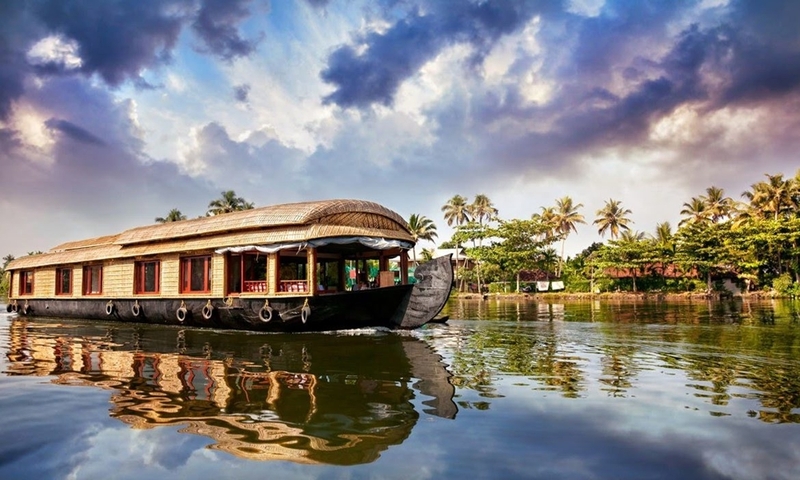 In order to get a rich experience of Kerala’s backwaters, most travelers prefer to enjoy a relaxing houseboat cruise. They say it gives the holiday an exquisite climax. After being mesmerized by misty hill stations and exotic wildlife, travelers experience a sense of calm and peace when cruise through the backwaters in the elegant abode. A houseboat is a 120-ft long boat structure. Because of its tasteful interior design, it looks exactly like a house from the inside. It has well-appointed rooms, a kitchen as well as en-suite bathrooms. And since travelers from all over the world try the houseboat cruise offered in Kerala, a houseboat is designed with international standards in mind. The boat cruises at a gentle pace. So you have plenty of time to relax and feast your eyes on the quaint village scenes across the lake. Some of those pleasant scenes include tropical coconut palms, paddy fields, traditional huts and cottages and beautiful canoes. You will also see villagers going about doing their daily chores. Houseboat Cruise services in Kerala offer two types of cruises. The day cruise is usually 4 hours long. It starts at noon and ends by 4 or 5 PM. This type of cruise is ideal for travelers who wish to experience the houseboat cruise but want to spend the night at a backwater resort. Once you check in to the houseboat at noon, you get a warm welcome on the boat with delightful drinks. As you settle down and enjoy the scenic views of the backwaters’ shores, the chef serves you an elaborate lunch. If you prefer a vegetarian meal, they do not include the fish fry. They serve ‘Payasam’ instead. It is a traditional Kerala dessert made with milk and vermicelli. After your delicious and satisfying lunch, you can sit back and relax. The houseboat will cruise through narrow canals and you get to see charming villages, lush paddy fields, churches as well as temples from a closer distance. The chirping of exotic birds creates the ideal background music for your cruise. It’s like a beautiful cherry on the cake. At this point, you can ask your driver if you could get your hands on the steering wheel. He would happily leave his place for you. As you sit on his chair and steer the boat, you know it’s a picture perfect moment. Try to capture it from every angle possible. And the perfect snapshot would look great on your wall. As the cruise reaches its end, the chef serves you hot tea or coffee as well as authentic Kerala snacks. Most times, banana fritters are served as snacks. Soak in the last moments of this incredible journey from the sun deck. And by this time, you’ll already be thinking about returning to try a longer cruise in your next visit to Kerala. The Overnight stay at the houseboat is ideal for travelers looking for a complete houseboat experience. It starts at 12:00 PM and ends by 9:00 AM the next morning. The cruise starts similar to how a day cruise starts. You get a warm welcome on the boat with delightful drinks. As you settle down and begin to enjoy the scenic views of the backwaters’ shores, the chef serves you an elaborate lunch. The lunch menu would consist of the same items mentioned above. After your delicious and satisfying lunch, you can sit back and relax. The houseboat will then cruise through narrow canals and you get to see charming villages, lush paddy fields, churches and temples from a closer distance. This doesn’t happen in Kumrakom since it doesn’t have narrow canals. The chirping of exotic birds creates the ideal background music for your cruise. It seems like a beautiful cherry on the cake. At this point, you can ask your driver if you could get your hands on the steering wheel. He would happily leave his place for you. When you sit on his chair and steer the boat, you know it’s a picture perfect moment. Try to capture it from every angle possible. And the perfect snapshot would look great on your wall. As the sun starts setting, you can go and enjoy the view from the sun deck. While you soak in the beauty around you, the chef brings you hot tea or coffee with authentic Kerala snacks. Most times, banana fritters are served as snacks. When you sip your tea and nibble the snacks with all this glorious beauty around you, you start to realize what a fantastic experience you’re having. What’s coming next is a total surprise. You’ll be given traditional fishing rods to try your hand at fishing. It seems hard at first but then it gets super exciting after your first catch. Usually, your first catch would only be a small fish. And then you want a bigger one. The experience is complete fun. You don’t realize how time just passes by until it gets quite dark. If you’re lucky enough, you can catch a good fish. The chef will cook it for dinner. You could also buy some local fish from the vendors at the shore. Make sure you check with the chef what price you should pay for the fish. Otherwise, you’ll end up paying a lot more than its actual cost. Some houseboats have TV with DVD player. You could watch a movie with your friends and family while eating dinner. If you prefer a vegetarian meal, they serve Aloo Gobi (Potato and Cauliflower) and Cabbage curry instead of Chicken Roast. After your dinner and some lovely conversations with your friends on board, you’ll enjoy a good night rest amidst the waters in a well-designed bedroom. Some houseboats are air-conditioned while some are not. It depends on the cost you pay. The delightful birds and warm sunshine wake you up early in the morning. You’d want to get up early because you know these are going to be your last moments in this beautiful houseboat. And you’d want to make the most out of them. The calming view of the backwaters as well as villages is just what you wanted to wake up to. The hot coffee just makes it better. And before you know it, you are served your breakfast. Then after your breakfast, it’s time you say goodbye to the friendly house staff and the houseboat itself. The check-out time is usually 9:00 AM. Click here to know other ways of exploring the backwaters of Kerala.